Looking for an insider travel tip? Here it is: This fall is a good time to travel if you’re looking to spend less and get more. Fall always offers some of the year’s best prices, and this autumn, travel providers coming off an okay-at-best summer are scrambling for ways to keep travelers looking for new horizons. No matter where you’re off to this fall, keep a sharp eye out for low prices, regularly occurring sales, and perks and other added-value offerings. I’ve monitored trends, industry news, and sale patterns to point you in the direction of places that offer the best bargains for the coming season. Below you’ll find examples of deals presently available for fall trips. Like all deals, these are sure to expire; however, a little research on your part can yield similar results when you’re ready to book. Late summer and early fall is hurricane season in Jamaica and most of the Caribbean, but if you’re willing to take a chance, you’ll be rewarded with major discounts driven by the seasonal drop in tourism and the lagging economy. Play it smart and you won’t have to worry too much about the weather: These days, many resorts and vacation providers offer some kind of hurricane refund or rebooking guarantee. Air Jamaica has a sale for bookings made by September 1 for travel September 1 through November 17 with round-trip fares such as $138 between Orlando and Kingston, and $238 between New York and Kingston. It seems likely that Air Jamaica and other carriers will debut more sales as fall creeps closer. CheapCaribbean.com has slashed prices on air-and-hotel vacation packages. For instance, airfare from Ft. Lauderdale (other cities available at a higher rate) and a four-night stay at the Grand Palladium Jamaica Resort & Spa during September or October is $519 per person, marked down from $1,059 per person. Jamaica is bursting with fall lodging discounts. The all-inclusive Sunset Jamaica Grande Resort & Spa in Ocho Rios is offering more than 60 percent off rates, starting at $136 per room, per night; Sunset Resorts in Montego Bay and Negril are also on sale this fall. Get three nights for the price of two with the third-night free special at all-inclusive SuperClub Resorts in Jamaica, with rates from $398 per person for three nights, or from $178 per room for three nights at the chain’s more basic Rooms Resorts. 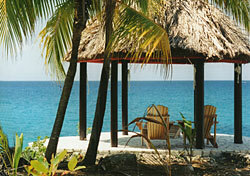 At the Rockhouse Hotel in Negril, rates for rooms big enough for four adults start at $125 per night. Even ultra luxury is on sale: At the Ritz-Carlton, Rose Hall Resort, rates start at $169 per night with the four-for-the-price-of-three-nights package. Offers like these can be found at hotels and resorts around the island, making Jamaica a true bargain this fall.